This guide describes the procedures for installing, cabling, and provisioning Uplogix Local Managers. Please read the Uplogix Safety Summary before proceeding with installation. The power source must meet all requirements to ensure safe and reliable operation. Ensure the installation site ambient temperature does not exceed 113F (45C) or fall below 32F (0C). The unit will overheat if the sites does not meet these requirements. Use only the power supply provided with the Uplogix 500 and 430 Local Managers. Using a different power supply will void your warranty and may damage the equipment. The following optional equipment is available for Uplogix Local Managers. Follow these steps if a v.92 modem is not already installed in the option slot. Power off the Local Manager. Remove the option slot cover, align the modem carrier card with the internal rails, and slide the modem into place. Power on the Local Manager. Follow these steps if a DB-9 serial module is not already installed in the option slot. Remove the option slot cover, align the DB-9 card with the internal rails, and slide the card into place. Install an activated SIM card on the modem. Feed wire into the option slot compartment, align modem cover plate with the option slot screw holes, and replace the screws. Note the Electronic Serial Number (ESN) on the modem, as this will be needed in order to activate the modem on your carrier’s network. Remove the option slot cover, align the carrier card with the internal rails, and slide the module into place. SFP modules are hot swappable, but the SFP carrier option card is not hot swappable. Environmental monitoring is available via a USB-connected temperature and humidity sensor. Follow these steps to connect the sensor. Note the Local Manager does not need to be powered down for installation of this sensor. Plug the sensor into one of the two USB connections on the Local Manager. Place sensor collection end in the area you wish to collect environmental information, ideally not near a fan or on hot equipment. It may take up to 10 minutes for the sensor to normalize to the environmental temperature and begin reporting consistent data. Use the following procedure to install or replace an expansion card. Always power off the Local Manager before installing or removing expansion cards. Using a #2 Philips screwdriver, loosen the module screws securing the blank faceplate or the option card to be replaced and remove it. Slide the new or replacement option card into place. Ensure the two module retention screws are threaded into the faceplate of the card. The screws will align to holes in the chassis if the screws are slightly backed out of the front panel. Installing the option card with the screws fully engaged makes it difficult to install the card properly. Look inside the chassis and find two tabs close to the front of the option slot and two located further back. Place the rear edge of the card on the two front tabs, tilt the card up and slide it back so the card edges slide below the two rear tabs. Gently push the card back until the card seats in the connector on the backplane. If it is difficult to slide the card or if the card resists being properly seated, the card is probably not installed correctly. Remove the card and start over. Very little force is required to install the cards. Tighten the module retention screws to ensure that the internal connector seats properly. Over tightening the screws may strip the threads and is not required; finger tight is sufficient. As you install the retention screws, you may encounter some resistance. If needed, use a #2 Philips screwdriver to overcome this resistance but use care not to cross thread or strip the screw. If you are installing a 16 port serial card, attach the supplied octopus cable to the connector on the front of the card. Uplogix Local Managers are designed for standard 19-inch telco racks. The Uplogix 500 ships with rubber standoffs for desktop use. Use the included screws to attach the mounting brackets. 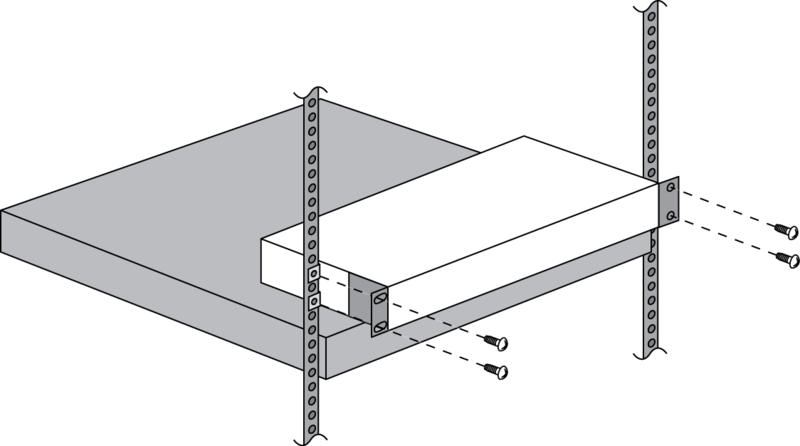 Use the screws provided to attach the mounting bracket. 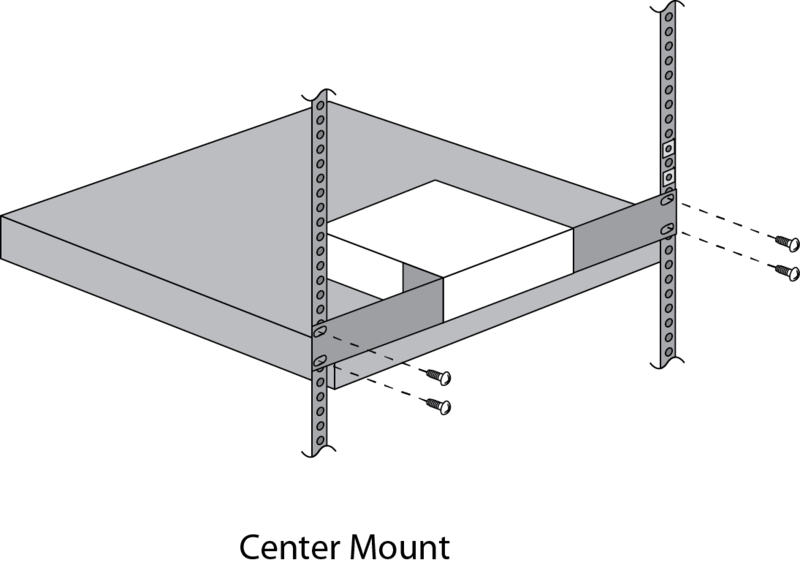 The mounting bracket can be installed on either side of the Uplogix 500. Mount the Local Manager in the rack. Before connecting the Local Manager to power, ensure all site requirements are met. Connect the power cord to the Local Manager. Use either the provided power cord or one that is suitable for your location. The Uplogix Local Manager uses a power cord with a standard IEC-320-C13 female cord end. Connect the power cord to a power outlet. A dimly lit keypad and dark display indicates that the unit has power applied. Power the unit on by pressing the middle keypad button. The display on the front panel will illuminate and display progress messages as the device boots. At the end of the boot sequence, it displays the message Uplogix status good. 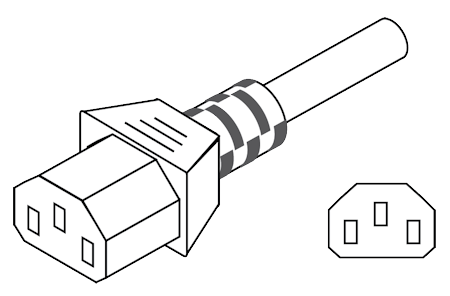 The DC Uplogix Local Manager uses a power cord with a Molex connector (part number: 39-01-4041) end and a three-wire split out. Connect the green yellow wire to earth ground, connect the brown wire to positive voltage and then connect the blue wire to power return. A dimly lit keypad and dark display indicates that the unit has power applied. Power the unit on by pressing the middle keypad button. The display on the front panel will illuminate and display progress messages as the device boots. At the end of the boot sequence, it displays the message Uplogix status good. 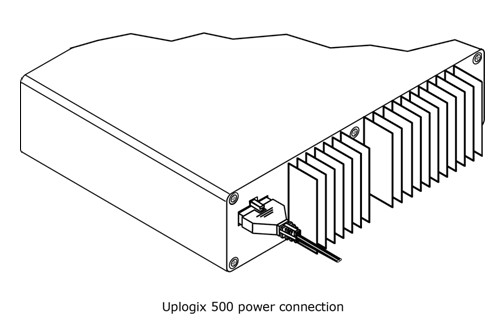 The Uplogix 500 Local Manager uses an external power supply, which is shipped with the device. Use only the power supply shipped with the Local Manager 500. Using a different power supply will void your warranty and may damage the equipment. Connect the power supply to the DC connector on the back of the device. Connect the power cord to the power supply. Use either the provided power cord or one that is suitable for your location. 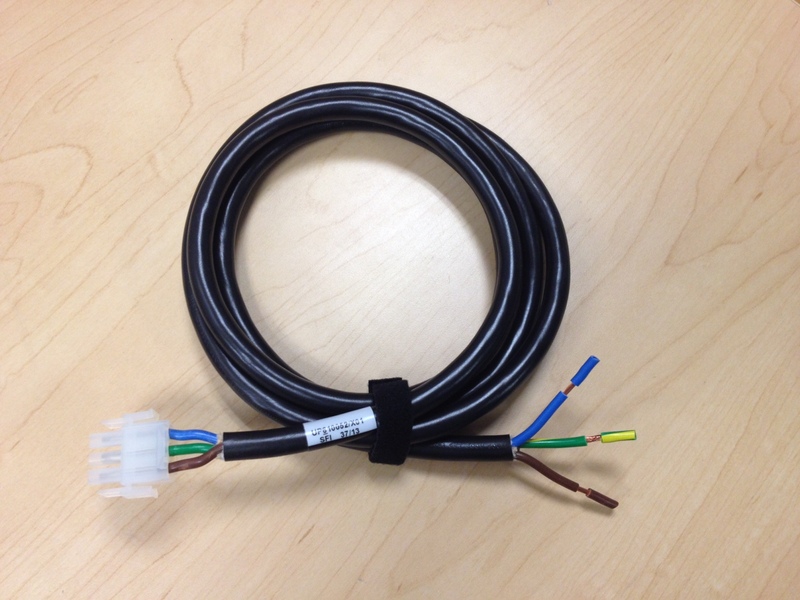 The Uplogix Local Manager uses a power cord with a standard IEC-320-C13 female cord end. Connect the power cord to a power outlet. An amber light indicates that the unit has power applied. Power on the unit by pressing the power button. The system status LED (denoted with an ‘i’ label on the chassis) will blink while the Local Manager boots up and becomes a solid green light when the boot sequence is complete. You are now ready to complete the initial setup of the Uplogix Local Manager.